Every beloved genre had to start somewhere! Whether it is because of hardware limitations or inexperienced developers, new styles of games often don’t accomplish all that the developers intend, though of course, we consumers often miss this. Years later, the vision of the original team becomes apparent as new titles expand upon the series. What better way to start off Fire Emblem Frenzy than looking back at where it all began in Fire Emblem: Shadow Dragon and the Blade of Light? As much as I’d love to jump into the game itself, some context should first be established. The 1988 Famicom Wars was one of the earliest turn-based strategy titles in Japan and was met with commercial and critical success. In a desire to create a fantasy setting as opposed to a modern one, Intelligent Systems began developing Fire Emblem. This title would set itself apart from Famicom Wars by being a tactical RPG; characters level up and have modifiable stats à la turn-based RPGs, while still having grid-based battles. On the 20th of April, 1990, this game was released exclusively in Japan for the Family Computer (NES). Clearly, something about it warranted many sequels, but is that magic still there 30 years later? Long ago in the continent of Archanea, the earth dragons and humans coexisted peacefully. As humans advanced, many dragons feared a loss of power and banded together to create the tyrannical nation of Dolhr. Naga, the dragon of light and protector of mankind, helped subdue the growing nation’s threat. However, years later, the prince of Dolhr, Medeus, was reawakened and poised to conquer Archanea once more. Enter Anri, a young man from Altea who wields the holy Falchion. Anri seals away Medeus and saves Archanea from destruction. A century later, the wicked Gharnef revives Medeus, starting a new war. Anri’s descendant, Marth, is forced into exile until he is strong enough to save the world as his ancestor did. Traveling across the continent, Marth recruits many allies and regains the Falchion and Fire Emblem in order to defeat Medeus once and for all. Shadow Dragon and The Blade of Light has a rather deep story for NES standards. When accounting for the many uses of cartridge memory, such as map design, characters, and stats, it’s impressive how everything was able to fit. While the story itself would be considered when compared to those of modern Fire Emblem, there’s a good reason for that: this game started it all! The war of dragons is almost always central to Fire Emblem games, and many entries, such as Genealogy of the Holy War and Awakening take place in Archanea. Almost every Fire Emblem game sees royalty roaming the lands to recruit a rag-tag army to vanquish a malevolent threat. However, as will be seen in future installments of this series, later titles often put their own spin on this concept, so this game’s plot is a bit bland in comparison. Unfortunately, this title has a significant issue that is seen in many of the early Fire Emblem games: the majority of the playable cast is bland and undeveloped. Due to the permadeath mechanic, it is impossible to predict who is still alive besides Marth, so the Altean Prince has the vast majority of dialogue. Besides the recruitment conversations, most characters have few chances to show interesting characteristics to allow for attachment. Without this bond, the stress induced by permadeath is purely one of gameplay. I’d argue that the assiduous playstyle used in modern games is due to the fear of loss. Instead of worrying over the death of a favorite character, Shadow Dragon and The Blade of Light relies on the fear of losing the experience invested into a character,but what exactly is the gameplay of Fire Emblem? On a grid-based map, characters move around, fight enemies, visit towns, and seize castles. Maps have many sizes and varieties of terrain offering stat and movement modifications. A unit has four inventory slots, which can be filled with items that are purchased, withdrawn from the convoy, or stolen from a defeated enemy. Items include specialized weapons, medicine, and many other types. Most items only have a certain amount of uses before breaking, and must be managed carefully to keep a unit safe. Items can be given to other units, but there is no trade option in this title. When spaced appropriately from an enemy, a unit can choose to engage in combat. The attacking unit has the first strike, though the opposition may be able to counter. If fast enough, the aggressor can attack a second time. Each attack has a small chance of inflicting triple damage in a critical hit. Depleting a unit’s HP kills them permanently, allied units included. Shadow Dragon and The Blade of Light was one of, if not the first, games to feature “permadeath”. This has always been in mainline Fire Emblem titles, and is, perhaps, the series’ most infamous mechanic. After combat, a unit gains a bit of experience if they survived an encounter, and a significant amount if they fell a foe. Accruing enough experience causes a level up, and each time a unit levels up they have a chance to increase stats such as Strength, Defense, HP, and Speed. This chance is determined by Growth Rates, a fixed percentage associated with each stat. Many units are crippled by low growths, so certain soldiers are undeniably stronger than others. This imbalance of stats amplifies a larger problem: Shadow Dragon and The Blade of Light is tedious. Tedium permeates everything; cursors and units move slowly, there are no indicators of unit movement range, and purchased items can’t be sent directly to the convoy. It’s clearly an issue of polish, as future entries will adjust everything for a smoother experience. The core gameplay, however, is addictive and rewarding, as almost every Fire Emblem is. Surviving an enemy ambush, creating a bottleneck to bombard the opposition with arrows, and defeating an opponent who outclasses you takes clever planning and leaves players in a great mood. Players could ignore all the flaws in 1990 because of such a stellar gameplay loop, which has always been with the series since. One aspect of Fire Emblem that has been present since the beginning is august music. The soundtrack of Shadow Dragon and The Blade of Light is great for its time, with catchy field themes and intense boss music. Many of the series’ motifs began here. However, some of the music was a bit repetitive, which is to be expected from an NES game. Visually, the game looks polished, though it lacks detail. Granted, most Fire Emblem games have sprite based maps, so losing a few colors and fine detail isn’t jarring to me. However, the visuals only improve from here, so I wouldn’t call Shadow Dragon and The Blade of Light a visual masterpiece. Obviously, there was no predecessor to Shadow Dragon and The Blade of Light, so I can’t analyze what it adds to the series (besides starting it!). Instead, it is best to look at what is missing when comparing it to newer titles. If you recently played a 3DS Fire Emblem and want to go back to where it all began, you’ll find gameplay that is much simpler than modern games. Staples like the weapon triangle and support system are absent, it’s much easier to double attack, and the experience gained from deathless combat is much more generous. If there is one thing Shadow Dragon and The Blade of Light has, it’s potential. Potential to start not only a series, but an entire genre. 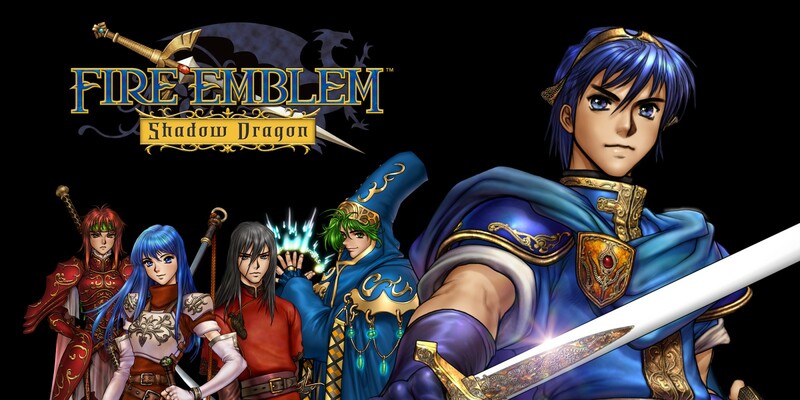 Series like Disgaea and Valkyria Chronicles can all trace their roots back to Fire Emblem. Without this ambitious title, none of those games may have ever existed, and for that, I respect Shadow Dragon and The Blade of Light. If you plan to play every Fire Emblem title before the release of Three Houses, I would recommend skipping Shadow Dragon and The Blade of Light. It’s been remade twice, so you won’t miss out on anything. However, if you plan to make a pilgrimage to the game that started the tactical RPG genre, then this is the game. It may be worth playing for the novelty, but not if you’re looking for the best Fire Emblem game. While it’s certainly outdated, I have to give Fire Emblem: Shadow Dragon and The Blade of Light credit; for without it, one of my favorite genres may not exist.